Richard Breese does it again with an interesting game of bluffing and balancing power influence. 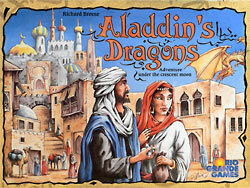 The theme is most certainly slapped on, and has nothing to do with how the game plays (players interested in Arabian Nights should play... well, "Tales of the Arabian Nights"). Some of the mechanics might get a little repetitive after a while (each round consists of working up your way from the caves to the palace, each space being resolved in a "who has the most influence" battle). Basically worthy.